Tonight, I'm hopping over the pond for a very brief trip with my chum Karigee. Alas, Suttonhoo was to go too but has fallen prey to consumption (we pray only temporarily). 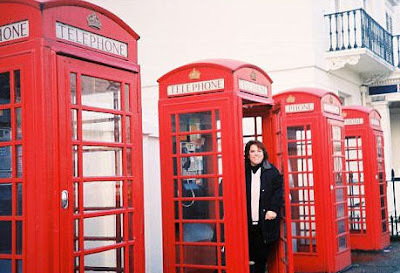 It's my third trip to London - the last was in 2004 with my mum. I will see something in the West End - I just haven't decided what yet and plan to check out the TKTS in Leicester Square. Apologies to all my UK chums, I'll see you next time. Cheerio! Have a great time! Bring back plenty of pictures and stories! See you soon, mon amie! I think Strongbow will have medicinal powers for you across the pond, so I'll drink up for you! WILL MISS YOU!